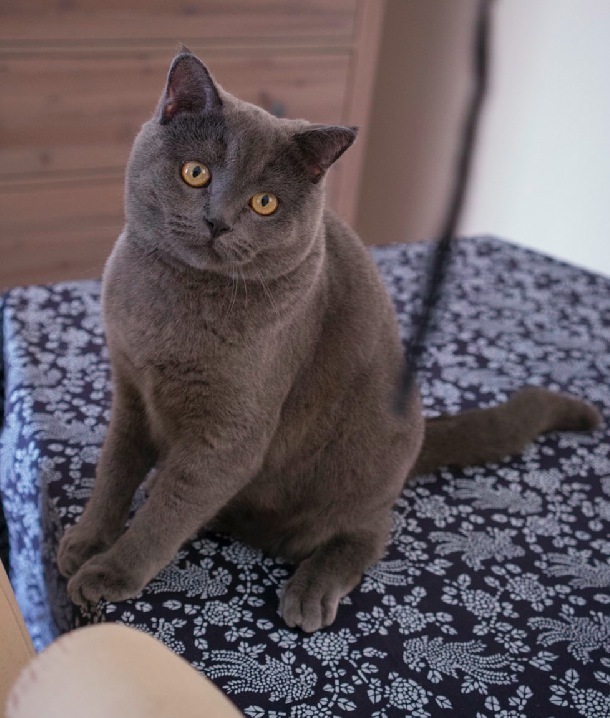 In the first part of the series I told you how we keep Sam safe, now let me tell you how to keep your indoor cat engaged and exercised… which is very important, otherwise your cat would just eat, sleep and get fat! Sometimes Sam chases his own tail, he runs full speed through our flat for no apparent reason – and that’s when he is playing with himself. He is pretending to chase a mice or small prey and it’s fun to watch him acting out his natural traits. But most of the time, he is too lazy to do that. Sam’s favourite game is hide and seek – he will walk up to me, look at me, then run away and hide in the bathroom. I then have to walk to the bathroom, looking and shouting for him, and then when I get closer he will jump out of his hiding place trying to scare me. Of course, by that time, I’m just laughing, because I know what is coming. We then turn the game around. He stays in the bathroom, I look at him, walk away and then hide in the kitchen or bedroom. I have to look around the corner once, that’s the sign for him to come looking, and then within seconds he appears in front of me, smiling from ear to ear and jumping at my leg. Cats have a strong need to hunt. It is a part of their being, of who they are. Sam loves to chase little balls around the flat and he can either do it by himself, or he waits for someone to throw the ball down the aisle and then he will run, chasing after the balls. He also has a toy mouse that is tied to a shoe lace, so I can pull it away from him or he can also pick it up when it gets stuck under the TV bank (he figured out how to pull on the shoe lace to get his beloved toy back). 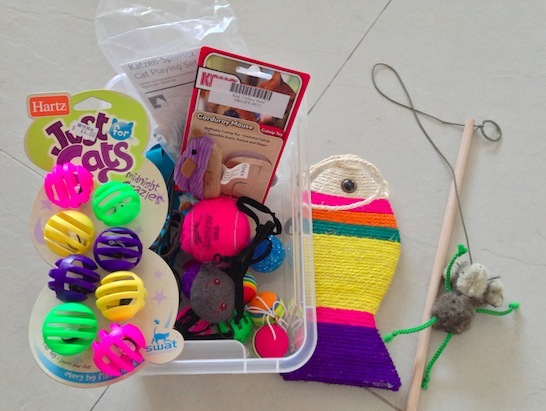 Here are a few toys that you can easily order online, I’ve got a few mice and balls from PetProject, and Sam really enjoys them. Reusing cardboard boxes, empty kitchen rolls, film rolls etc. While I still purchase some toys for Sam every now and then, he actually loves paper rolls (he could just wrap himself in toilet paper or kitchen roll all day). I try not to give them to him, as he will just make a big mess and we will have confetti everywhere, but I can give him empty kitchen rolls or paper boxes – and he’ll play for hours with those. Human powered cat toys, such as fishing pole type toys, most closely mimic the movements of live prey – and that’s why Sam loves this play so much! 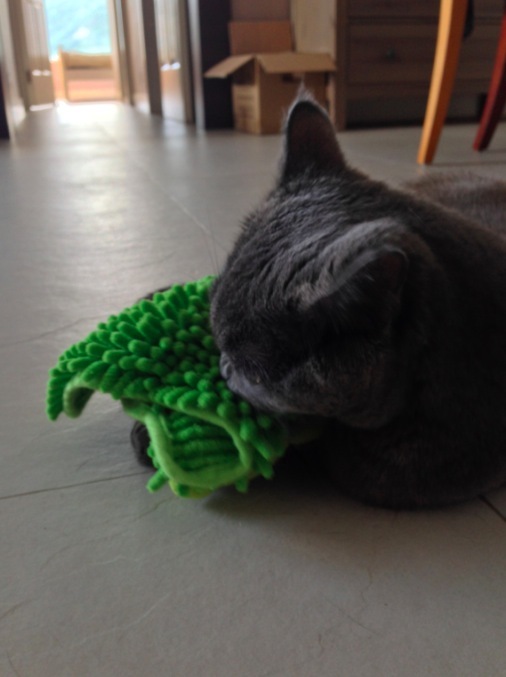 I wiggle the toy along the ground and up the furniture, and use lots of stop and start motions to mimic live prey. Sam will get so excited! I just have to ensure he catches the toy prey once in a while so he feels he’s part of the game! When play time is winding down, I will let him catch the prey and keep it – then he knows the game is over. Then I just store the fishing pole away, because it is not safe for cats to play with them alone. Some cats love to chew on strings and they could choke and suffocate. One good tip to keep Sam happy is to only have him a few toys and lock the others away. This helps to peak his interest and keeps him from getting bored with the same old things. He knows, that when I open one specific kitchen drawer, there will be a new surprise for him! If I haven’t played with Sam for a while, he will start chasing me wherever I go. He will try to hang on to my legs, to stop what I am doing and to start play time! So precious! Love his colour!! You are such a good cat mother, you are perfect!! And Sam is happy and healthy! It’s make me happy when you write about him. I hear so much about animals being abused, thrown out of running cars !! or just abandoned. It breaks my heart, but then I love you for loveing Sam! Thanks – he’s a good little fellow. A little big naughty sometimes, but overall gentle and warm hearted. I just need to make sure I find enough time to play with him, especially as the new flat is not great for chasing balls (too many corners and obstacles), so he doesn’t play much on his own.